Nativa en Colombia; Alt. 1000 - 3200 m.; Andes, Sierra Nevada de Santa Marta. Tillandsia confinis var. caudata L.B.Sm. Barbosa-Silva, R.G. & al. (2016). Over the hills and far away: New plant records from the Guayana Shield in Brazil Brittonia 68: 397-408. Gouda, E.J. (2011). A discussion about Tillandsia confinis L.B.Sm. and Tillandsia dudleyi L.B.Sm. 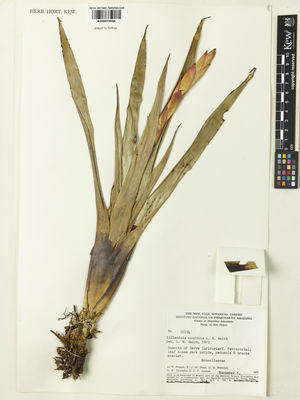 Journal of the Bromeliad Society 61: 158-161.